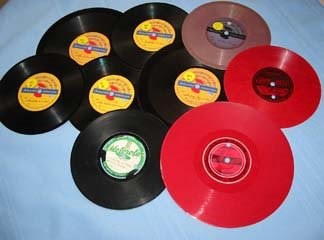 I've had these old homemade records that my mom had preserved carefully packed in a box since 1943. She tried to play them for me once decades ago on an old record player but they were very scratchy and difficult to hear. They are homemade recordings that my uncle Les made in Venice California during WWII. But what made them most interesting for me is that Les interviews my dad who died in 1945, my mom gone since 2006 and my self as a little blond girl about 3 years old. Always curious to what my dad's voice sounded like, I took them to a company in Salt Lake City that restores and digitizes old recordings, films and videos. Now I am in the processing of transcribing them and improving the sound quality to make CDs for my family members who knew and still miss these family members. Les also interviews his wife Esther, daughter JoAnn and two of her little friends, his bro-in-law Norman, his wife Gladys and their child Ruth. Most of these people are no longer with us but waiting in the heavens for the great family reunion we'll have one day. As I'm doing this transcribing, I realize how important it is for each of us to preserve our voice for our progenitors whether on tape, video tape or just written down. There will be those of our grandchildren or extended family who will treasure our words and remember the contribution we made to their lives. So let me encourage you again to write your biography or experiences from your life, whether by blogging or emails or in a printed record to leave for your family and friends. We do make an impression on others during our sojourn here on earth. What a treasure! Your family members are fortunate to have you do this to pass on through the generations. Since meeting you, I have started searching my family history and let me tell you...it is quite an undertaking. I haven't had much luck so far. I found one of my dad's brothers' birth certificate (there were 13 of them). I'll keep looking. I am so happy that you will be able to have the voices of your relatives. My sister recently took some old family videos and had them put on DVD. I can almost hear my grandparents, but I wish they had had sound back in the 60's. This really is a treasure. I hadn't thought of an audio record. Wow! Lin, I would love anything that is connected with our line. I am currently in the process of interviewing Jody and Keith as well as other family members for an autobiography/biography of their lives. It would be such a treasure to include those recordings. Please let me know what I can do to help. My goodness, what treasures, Lin! Good for you for getting this done. So important. Wow. I am thinking of a friend who used to goof around in his dorm and sing. His friend recorded the "music." I have encuoraged my friend's friend to give these recordings to my friend's parents since he is no longer with us. What a gift! I hope he follows through. Thanks for sharing this story of those records. awesome! what a fabulous family treasure you have. Oh Lin, this is wonderful I agree with you. I think it is important, recording stories too. I took folklore in college. They taught that you should record without telling and tell later, to get the right story and voice, btw.. I wish I had taken it before everyone died, but afraid I lost my family at an early age. I love what you're doing, and these old records are great, and to think they are your families voices.. wow..